Although some black Mississippians celebrated the United States' impending victory over the South as the Civil War wound down, most of the heretofore disfranchised sons and daughters of Africa found themselves pushed back to the bottom of the social heap at the war's end. Abraham Lincoln was dead, assassinated in April 1865. Former Tennessee Senator Andrew Johnson, Lincoln's Vice President, had succeeded to the Presidency and sympathized with the Southern "yeoman" class, which included the average businessman and small-scale farmers and sought to turn state's power over to them while keeping blacks off the political power stage. Johnson tried to block nearly all the new legislation favorable to the rights of black men and women who were now full citizens of the U.S. Johnson vetoed the Freedman's Bureau Act and the Civil Rights Act of 1866. Congress passed two Reconstruction Acts over the President's veto in March of 1867. At first, these pro-black rights Republican activists were called "Black Republicans" by their enemies, although the Party of Lincoln was officially nearly all white immediately following the Civil War. As more and more black men were brought into the ruling political framework, the idea of a "black and tan" voting bloc, referring to the skin colors of the newest enfranchised Republicans, gained preference over a "Lily White" party. The conflicts and battles between these two groups of Republicans would continue well into the 20th Century, until President Dwight D. Eisenhower finally ordered the "Black and Tan" Republican Party dissolved in 1956. Five Military Districts were set up by Congress in 1867 in the occupied South to oversea elections and to protect the rights of the newly enfranchised freedmen. Mississippi and Arkansas constituted one district and was under the military governance of Gen. Edward Ord and later Gen. Adelbert Ames, who was elected Governor in 1873. The fighting Senators and Congressmen, backed by their abolitionist crusaders, and nearly 200,000 black veterans of the Civil War, were determined not to see their hard-won victories squandered by the redneck Johnson. They brought him up on impeachment charges that lasted for four months -- from March to June -- in 1868 for illegally firing some of the cabinet members appointed by Lincoln. Johnson was acquitted, but Congress began instituting its own Reconstruction policies for the South and used the occupying military forces to make their wishes a reality. It was inevitable that the "Party of Lincoln" -- the Republican Party -- would be given special status in the occupied territories. In Mississippi, the military officers organized the "Union Party" and welcomed black voters into the political system. Naturally, since the majority of Mississippians in 1867 were black, they could be expected to deliver overwhelming election majorities to the Republicans. It soon became obvious, however, that all the top political appointments were going to the white Republicans from the North and to some of the Southern white "scalawags" siding with them all over the state of Mississippi. The U. S. Congress mapped out its own Reconstruction plan, called "Black Republicanism" by their enemies, and granted the vote to all adult black males in the former slave states. The state's 1868 Constitutional Convention in Jackson became known as the Black and Tan Convention because most of the well-educated black men who had fought against slavery expected to have their political priorities met. Their political agendas were rather modest, calling basically for free public education and the right and freedom to vote. The white Northerners could be just as racist as their Southern counterparts, but they realized the expediency of sharing some of the power with the black leaders, who were serious about building a society that would bring black men and women up to the same standards as whites. Because of some punitive elements of the 1868 Mississippi Constitution, it went down in defeat, due partly to some white manipulation of ballots in rural areas where blacks had never voted before and partly because some of the white Republicans were creating secret alliances with a group of local white Democrats who dreaded black rule. Under Ord and later under Gen. Adelbert Ames, all political offices were declared to be illegally held by "unredeemed" white Confederates who had not regained citizenship in the U.S. The generals appointed their own choices to every local office pending the constitutional convention of 1867-1868 and the elections that were to follow in 1869, elections in which black men would be able to compete for office. 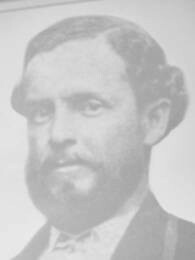 Thomas W. Stringer of Vicksburg, a native of the black Canadian settlement at Buxton, Canada, was elected state senator in 1869, thus becoming the first black state legislator to serve in Mississippi and the first to give legitimacy to the Black and Tan power matrix. Benjamin Montgomery of Warren County, however, had actually been the first black man to hold a public office in Mississippi, having been appointed justice court judge for Davis Island in 1867. W. E. B. DuBois points out that although there were only 38 members of the Mississippi House of Representatives at the high point of black representation, African Americans could achieve their political and economic goals through effective bargaining and coalescing and exercising their own right to obtain power. The real genius behind what became known as the Black and Tan Revolution of 1873 was Thomas W. Cardozo, a half-black, half-Jewish native of Charleston, South Carolina, a master schoolteacher and administrator who settled in Mississippi at Vicksburg in 1871. Warren County was 80 percent black at the time of Cardozo's arrival. Having lost several hard-fought political battles with his white Republicans counterparts in both North and South Carolina, Cardozo was not satisfied when the white Republican boss of Warren County, Sheriff Charles E. Furlong, offered him the Circuit Clerk's position and demanded that Cardozo siphon off a good portion of the fees he collected into the sheriff's coffers. Cardozo struck up an alliance with Peter Crosby, Furlong's black chief deputy, I. D. Shadd, a state representative and future Speaker of the Mississippi House, and Warren County Constable William T. Montgomery, the older son of wealthy black plantation owner Ben Montgomery, the first black man to hold public office in Mississippi. Their plan was to marshal as many of their black and white allies in the Black and Tan Republican bloc as possible to demand that black men be elected to at least half of the top political offices in the state. At the local level, they developed a strategy to get black men elected to the top county offices wherever they had an obvious majority of the population. The Cardozo-inspired Black and Tan revolutionary plan was put into action for the statewide elections of 1873. The result was that the lieutenant governor of Mississippi was a black man, Alexander K. Davis. The Secretary of State was black, Jim Hill; Speaker of the House, John Roy Lynch; Superintendent of Education, Thomas W. Cardozo. Although black U.S. Senators Hiram Revels and Blanche K. Bruce won election without fully embracing the Black and Tan principles, they both nevertheless were beneficiaries of the spirit of solidarity and black self-determination espoused by Cardozo, Shadd and the other Black and Tan activists. Peter Crosby was elected sheriff of Warren County on the same Black and Tan ticket. So were 11 other black sheriffs and innumerable supervisors, city aldermen, and other county officials elected based on the black voting strength throughout two-thirds of the state. The taste of power lasted only two years for most of the Black and Tan revolutionaries. The three top dogs of the Party -- Lt. Governor Davis, Supt. of Education Cardozo and their white ally, Governor Ames -- were all brought up on impeachment charges after the white Democrats regained political power through gunfire and intimidation of isolated rural blacks in 1875. Rather than go through with the impeachment process, however, Cardozo and Ames resigned. Davis held on and tried to ride out the impeachment plot in a now white-supremacist legislature. He lost out at the impeachment trial and was forced to resign his office in 1876. Although the Black and Tan power move had dissipated, some of the players remained in the political mix in select spots around the state. Sheriff Peter Crosby, who had been chased out of office at gunpoint by a white mob in December 1874, regained his job at gunpoint and through the courts. He served out his term as sheriff and was elected Warren County Justice Court Judge in 1878. U.S. Senator Blanche K. Bruce, now the most powerful black elected official from Mississippi, found it expedient to remain in Washington until the end of his term in 1881. Many other black political office holders also retained their positions. It was only in 1902 that the last of the Black and Tan state representatives left office in Mississippi. The party retained its legitimacy and even moved its Mississippi party offices to Washington D. C. in the 1920s. The real downturn in Black and Tan political fortunes came with the accession of Howard Taft to the Presidency in 1908. Taft, in defiance of the Teddy Roosevelt "progressives," ignored the black Republicans of the South and locked arms with the white supremacists there. Herbert Hoover proved to be even more treacherous towards his black Republican cohorts. He threw all his support to white party factions from the Southern states and made blacks feel unwelcome at all party functions. As the emerging "Lily White" Republican Party gradually caught a foothold in Mississippi, the final demise of the Black and Tan Party was inevitable and finally arrived with the Eisenhower administration's second term in Washington. "In 1956 the modern Mississippi Republican Party was recognized by the National Republican Party as the official state organization," a study from the University of Southern Mississippi points out. "This ended the recognition of the "Black and Tan" faction of the party. The party then began to grow slowly in the state. In 1959 a (white) Republican was elected coroner in Holmes County. In 1960 Joe A. Moore ran as a Republican against James O. Eastland in a state-wide race for the United States Senate. And in 1963 Rubel L. Phillips made the first strong Republican challenge in twentieth century Mississippi politics when he ran for governor against Paul B. Johnson, Jr."
Other states also were the political breeding ground of the Black and Tan Republican Party. Texas had a strong Black and Tan organization there until the 1880s. It was the Texas Black and Tan leader Norris Wright Cuney who in 1888 first pinned the label "Lily White" on the Republicans who fought to supplant the Black and Tans in state and national party affairs. Even in the darkest moments of political exclusion within Republican ranks, devoted Black and Tan loyalists continued to hold onto the macro-Party's strings. The late Arthur Fletcher, for example, an old Black and Tan member, achieved favor with President Richard M. Nixon after his victory in the race for the Presidency in 1968. Fletcher came up with the idea of "Affirmative Action," a progressive notion, and was able to persuade Nixon to implement the program in 1969.